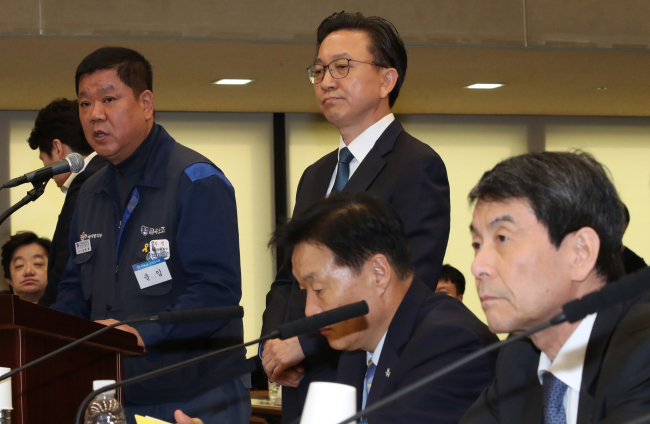 As controversy persisted over GM Korea’s plan to spin off its research and development unit, the nation’s tripartite labor commission put the brakes on the labor union’s push for a strike in opposition to the move. The National Labor Relations Commission on Monday ruled that further dialogue was possible between GM Korea’s management and the labor union, effectively blocking the union from staging a full-fledged strike that would now be illegal. The union has been claiming that GM was laying the groundwork to withdraw production here as it had done in Australia. The LRC is an independent quasi-judicial body that mediates and adjudicates disputes between labor and management. The commission said in its decision that the spinoff case was different from wage negotiations where the differences between the management and labor are distinct. It instead recommended the two sides proceed with the case through collective bargaining and that should the management refuse dialogue, the labor union can seek other legal measures such as filing against the company with the local labor administration. The labor union was set to enter a full-fledged strike if the commission ruled a compromise was no longer achievable. The union said it would look into its next step, while the company said it would set up discussion sessions with the labor union. On Friday, shareholders in GM Korea approved the company’s plan to establish a separate R&D unit named GM Korea Technical Center Ltd. despite vehement opposition from the labor union and doubts raised by the KDB. General Motors, the biggest shareholder in GM Korea with a 77 percent stake, approved the plan, while KDB, the second-largest shareholder with a 17 percent stake, couldn’t join the meeting because it was blocked from entering by GM Korea’s union, according to GM Korea and the KDB. Meanwhile, lawmakers grilled the KDB on its position on the spinoff. The bank’s chief, Lee, maintained KDB’s stance that the carmaker had not sufficiently explained the spinoff, which it had been aware of since April. “KDB is opposed to the spinoff for procedural reasons. KDB’s requirement for negotiation is if GM Korea submits specific reasons and business plans regarding the spinoff, KDB will negotiate (with GM) and decide,” Lee said during a parliamentary questioning session at the Industrial Bank of Korea headquarters in central Seoul. Adding that he could not agree the spinoff was a prelude to the automaker’s pullout of its operations from Korea, Lee also said that it was considering legal steps against the labor union for blocking the bank’s representatives from entering the shareholders meeting. Concerning the rescue deal agreed in late May, the KDB chief leaned toward completing the remaining $375 million investment due at the end of the year on the grounds that refusal to do so could jeopardize the framework agreement for GM Korea’s long-term business here. Of the $750 million rescue package agreed in May, $375 million was invested in June with the rest due by Dec. 31. Reiterating the carmaker’s position, GM Korea Vice President Choi Jong said the latest decision is part of GM’s efforts to strengthen the local unit and that it is devoted to long-term business here as promised.